Determined to redress the moggie-doggie bias of the internet Lauren Orsini decided to use a Raspberry Pi and a waterproof temperature sensor to monitor her fish tank. So it’s a real beginner’s project but one that can be expanded as you learn. Lauren, for instance, extended the project to turn it into a true Internet of Things device that texts her when the fish tank gets too hot. All in all it’s a great way to slowly build your Raspberry Pi computing skills. It’s also pocket money cheap. In fact if you already have the CamJam EduKit #2 then you already have the kit needed for this project. 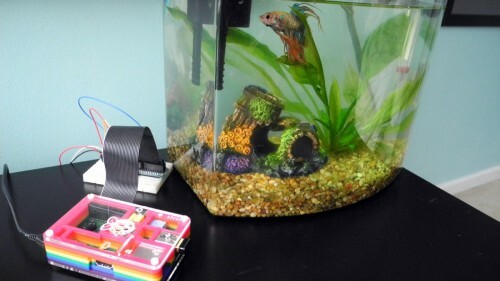 And of course the sensor doesn’t have to be in a fish tank. Monitor the temperature of your bathwater; your cup of tea; the fridge; your dad’s armpit while he dozes in front of the TV. If you’re looking for something to do with your Pi on the last day of your summer holiday then this comes highly recommended. Instead of tape, I’ve found terminal strip (google images) is fantastic for a secure connection between wires and or pins. 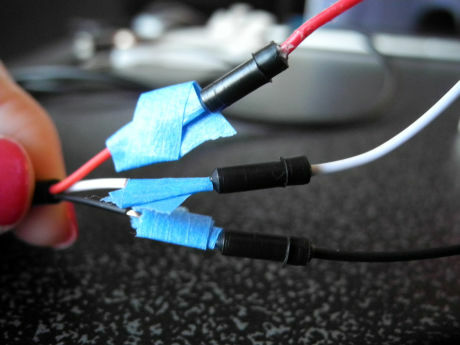 Alternatively cut off one end of the jumper pin and solder it onto the sensor lead. What’s The answer to the extra Homework question? ?